Alter The Press! : ATP! Album Review: You+Me - rose ave.
ATP! 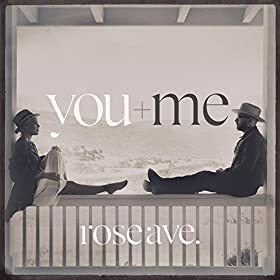 Album Review: You+Me - rose ave.
You+Me consists of two voices that I had no idea I needed to hear together until I listened. Alecia Moore, better known as Pink, is mainly known for singing badass, in your face pop anthems. Dallas Green performs under the moniker City and Colour, his folk/rock solo outfit. They have pretty different sounds in their respectable projects, but they come together for one gorgeous one in You+Me’s debut album, rose ave. The songs all have sparse instrumental arrangements, allowing the melodic voices of the two to shine. They trade off on verses and lines, while coming together later in harmonies, their voices fitting together perfectly. While equally strong singing alone, the magic really happens when their voices are intertwined, particularly on the gorgeous ending track, “No Ordinary Love,” which captures the beauty of this pairing perfectly. The arrangements give the songs a very personal vibe, making you feel as if they’re sitting in your living room singing this to you. Moore and Green tell emotional stories in each of their songs, none of them alike. “Love Gone Wrong,” is an album standout about a relationship that just wasn’t right, while the lead single, “You and Me,” tells of a relationship that’s absolutely perfect, even with all of its flaws. The lyrics are simple, but powerful, using few but precise words to weave the story in your mind. “Love is louder than all your pain,” Green sings in the chorus of “Break the Cycle,” telling her he’ll break the cycle of wounds and pain that she’s been going through. The only thing that could possibly be seen as a downside to this album is that none of the tracks sound like a hit radio single, but I don’t think they need to be. This album is what I wish more people thought of when they think of a radio hit. The songs are emotional, beautiful and captivating—ones that you want to just lay back and listen to all day. Moore and Green are an exceptional pairing, and one can only hope that this project is going to continue for a very long time. rose ave. will be released on October 14th via Columbia Records.